On this date in 1945, Waffen-SS officer Hermann Fegelein was shot in the Reich Chancellery’s basement, or else its garden. “One of the most disgusting people in Hitler’s circle,” in the estimation of Albert Speer, this rank opportunist had found his way there via Heinrich Himmler’s patronage. On June 3, 1944, Fegelein married right into Hitler’s personal clique by tying the knot with Gretl Braun — sister of longtime Hitler mistress Eva Braun. Hitler and Himmler were both official witnesses. They had a two-day wedding bash. Then the western allies landed at Normandy. Fegelein still found plenty of time to party and womanize for the eleven remaining months that he and national socialism had a run of the place. But as a rank opportunist, he also had his antenna up for a post-Nazi arrangement by the spring of 1945. Here, his proximity to power did him no favors. Posted directly to Hitler’s bunker as Himmler’s personal representative, the guy would have a harder time than some anonymous bureaucrat in slipping out of besieged Berlin. * When he absented himself from the bunker for two full days, Hitler himself noticed. The guy sent to retrieve Fegelein found him drunk in a Berlin flat, hurriedly stuffing valuables into suitcases with a mystery woman who promptly disappeared out the window. Having obviously been attempting to desert, Fegelein was in a fix when he was hauled back to the bunker. Unluckily for Fegelein, this was also the date that Reuters reported news that his patron Himmler had attempted to surrender Nazi Germany to the U.S. and Britain — news that made its way into the hands of a livid Hitler. You’ve got Fegelein trying to defect (incidentally inviting Eva Braun to come with), his boss is selling right out, and he’s consorting with a potential mole. 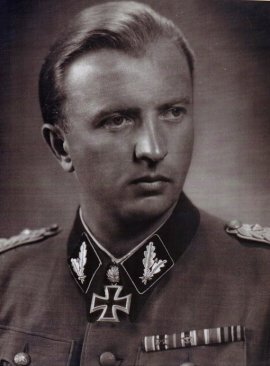 According to James O’Donnell, Hitler and his loyal satrap Martin Bormann were obsessed with leaks in the last days of the war, and the circumstances of Fegelein’s capture conspired to make him look like a potential source of those leaks. As the Fuhrerbunker consumed itself in paranoia, Fegelein — only slowly sobering up — disappeared into the hands of the Gestapo, and was shot. His body, presumably abandoned with other casualties of little interest to Berlin’s conquerors, was never recovered. Hundreds of kilometers to the south on the same day, Hitler’s longtime Italianate partner Benito Mussolini was getting his. It would be a stark warning to Germany’s fading dictator not to let the same fate befall him. Hours after Hermann Fegelein’s execution, his sister-in-law Eva finally wed Adolf Hitler … and on April 30, those two took their lives together. A week after Hermann Fegelein’s execution, on May 5, his widow bore him a posthumous daughter: Eva Barbara Fegelein, named after the child’s late famous aunt. * Fegelein had actually been out in Bavaria with Himmler — “safe”, relative to what happened to him — but taken a hazardous flight back into besieged Berlin just a couple of weeks before his death. He was either trying to be Himmler’s dutiful personal plant in the bunker, or trying to use his posting as a pretext to retrieve for the perilous postwar years the many valuables he had cached in Berlin.